I don’t really post much here anymore, I know. I’m far more active on Instagram—stories specifically—as of late. I started writing this as an Insta post reflecting on the past year, and it ran over the character limit. Rather than go into the comments, I figured I’d make my way back here. It’s a little bullet-pointy compared to my usual blogging style, but hey—it was intended for a different platform. Anyway, this is how my year went. It was a full one. It’s been crazy to look back at the last year. After floundering on all my creative/professional goals after our home flooded in 2017, 2018 somehow became the year when I did all the things—things I wasn’t even planning at the outset, “if you told me this time last year I’d have done this, I wouldn’t have believed you”-type things. I had ideas and I acted on them. I asked and was told yes. I was asked and I said yes. Things that I’d always wanted to do—and some that weren’t even on my radar—happened. I’m in grateful disbelief. The Gluten-Free Food Allergy Fest is coming to Brooklyn for the first time this weekend, July 28th and 29th. I’m thrilled to say that I’ll be giving a cooking demo on Saturday and will be there all weekend in their blogger booth as well. The fest is taking place at the Brooklyn Expo Center, which is a big, beautiful expo space in Greenpoint. There will be plenty of food vendors, several of which are veg-friendly. If you’re around, come check it out and say hi. Tickets for the fest can be purchased here. Use code “LeavesofKale” for 20% off. Hope to see you there! It happened. I did it. 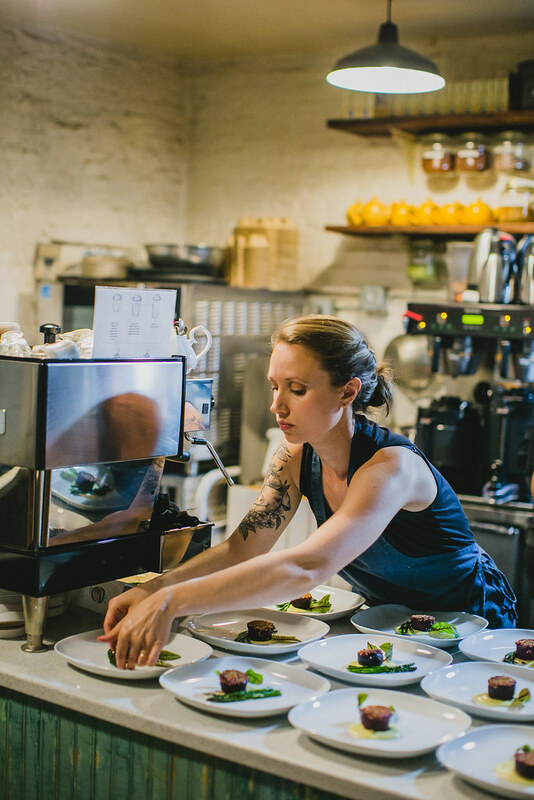 Last week I put on my first uprooted pop-up dinner. It was a six-course, spring-inspired menu, consisting of a handful of recipes that I’ve created over the years as well several that I crafted specifically for this event. The impetus was a moment of inspiration back in February: I could totally do this. I think this is what I want to do. Less than three months later, I made it happen. The whole thing has felt surreal since the moment it ended and, despite still having a few straggling leftovers in the fridge, already feels like something I’m looking back at from several weeks away instead of several days. The process of putting it together was as much personal as it was culinary or logistical—maybe more so. Once the date was set and it went from mere notion to very real thing that I’m about to do, I became filled with a sort of uneasy excitement. 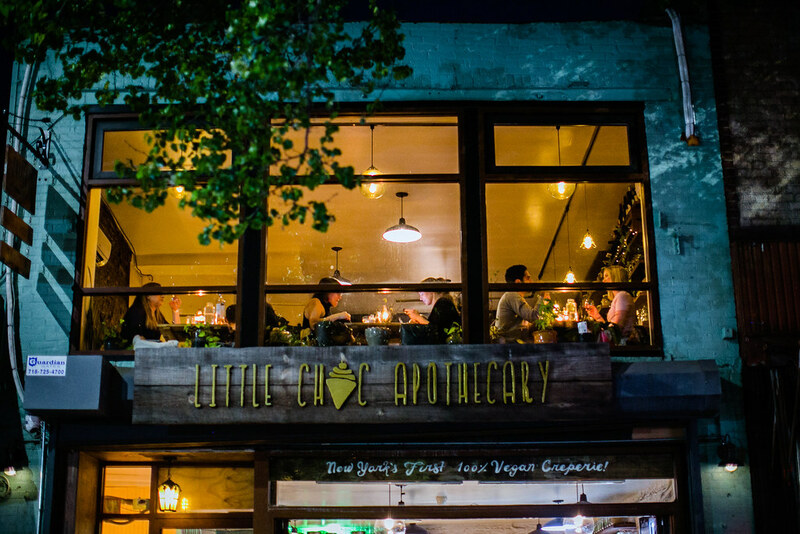 I remember walking home from the meeting I had with Julia—owner of Little Choc Apothecary, the venue that had agreed to host the dinner—where I’d gotten a quick tour of the kitchen and we’d decided on the date, feeling the giddy elation of holding a wonderful secret. It was real, but it wasn’t in the world just yet, which felt somewhat safe. Still, it was the sort of thing that depended on being cast into the light, on people knowing and showing up; this part was terrifying…. 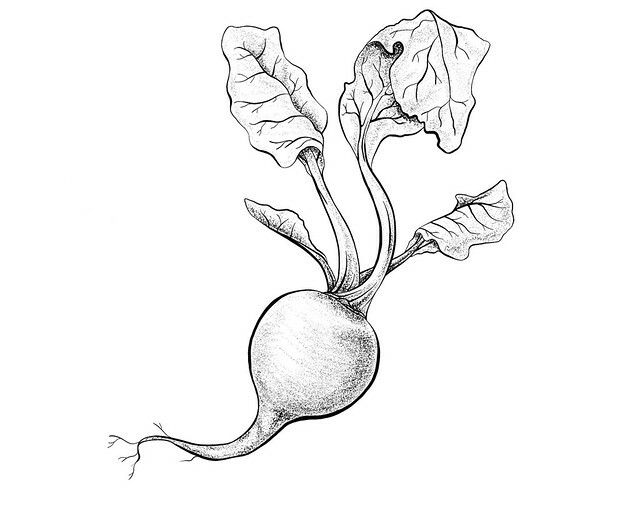 Next week I’ll be putting on my first pop-up dinner. I’ve been meaning and wanting to write about it since I decided I was going to do it, but I haven’t been sure what to say. And now I’m sitting here at 6:30am on Saturday, with only a few days to go, and my mind is racing. I’ve been terrified of all the usual things: that no one will come, that it will be awful (or, maybe worse, just meh), that I’ll disappoint everyone, including myself. I still have shades of some of these fears lurking in the back of my mind, though I’ve mostly realized that they’re not all that real and, even if they were, they don’t matter. I recently pulled up this site to make one of my recipes (yep, I do that), and realized that it’s been well over a year since I posted here. There are so many reasons for that and so much that has happened in the interim. I would like to start writing here again, though. Maybe not as consistently as my perfectionist tendencies would hope, but certainly more often than every 17 months. So let’s catch up a bit, shall we? I know. Your mouth is watering, tummy rumbling, because those two words placed side-by-side evoke utter deliciousness, amiright? Well what if I said aquafaba instead? Naturally this would be accompanied by an intense, piercing gaze and a completely over-the-top, arm-waving flourish of the hands. Because aquafaba is magic. And the magician of the moment is Zsu Dever. 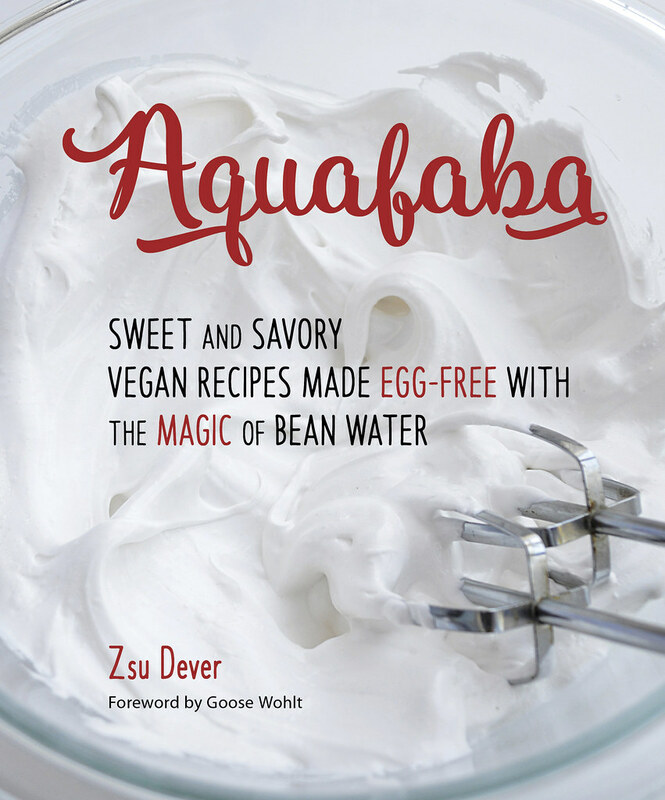 Not to reveal the magician’s secret, but aquafaba is, in fact, bean water. Don’t for a second think that that humble detail makes it any less wonderful, though. In case you haven’t heard, aquafaba—the water leftover from cooking beans or the liquid that comes alongside them in a can—has some remarkable properties. I’m not even sure where to begin. This past weekend was a glorious, laugh-filled, sleep-deprived adventure, one of those weekends that speeds by in a blur yet seems to contain a week’s worth of moments. It’s almost hard to write about it now. Sifting through all that happened, I find myself missing everything and everyone so much that my heart hurts. From last Thursday through Sunday, I was lucky enough to spend all day and night with an incredible group of vegans. We laced up our running shoes in the wee hours of Friday morning and took turns running a 200(-ish)-mile relay through the Adirondack mountains, all wearing matching black gear boldly emblazoned with the words “Strong Hearts Vegan Power.” At four teams of twelve runners, plus a handful of van drivers, we were a force, representing not only vegan athletic prowess but compassion for all beings. This race was significant for me for so many reasons. There’s the obvious: that it was amazing to spend several days with a massive group of vegans (more on that next), but it was also a huge milestone for me personally. 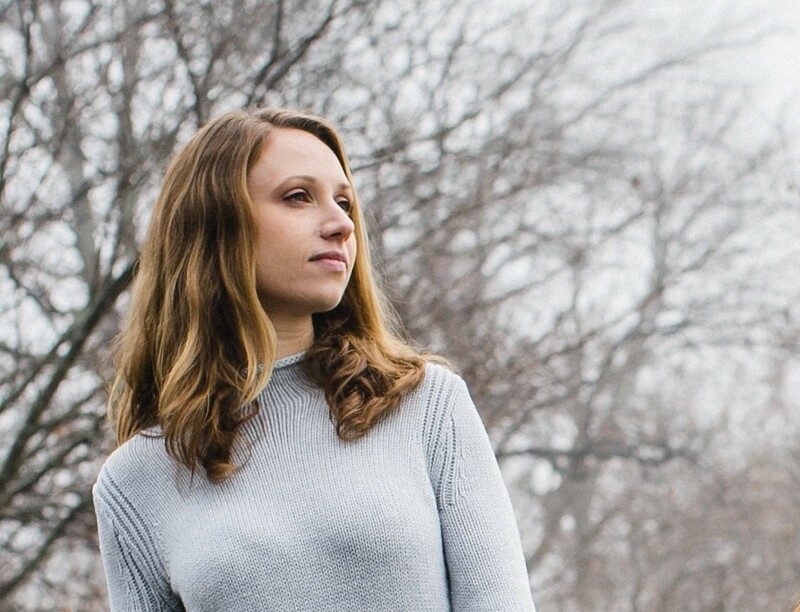 The recovery from my stress fracture after the NYC Half in March was painfully slow—not physically painful, since I was pain-free from about two weeks post-injury, but mentally it was torturous. The initial MRI results were crushing, and when the follow up MRI eight weeks later still showed a small fracture I felt frustrated and betrayed by my body. Another eight weeks later, in mid-July, a third MRI showed no fracture but minimal residual fluid in the bone, enough for my conservative doc to give me another 4 weeks to go. There were moments where I considered hanging it all up. The swimming I’d been doing during my recovery went from being a pleasant change of pace to this thing that I was doing because I still couldn’t run (in case my coach is reading, that came back around—yay swimming!). It became clear that there was no way I’d be able to build enough mileage to run the Philly Marathon in November and, since things hadn’t been trending so hot, I felt doubtful that the Philly Half or 8k that same weekend would even be possible alternate options. 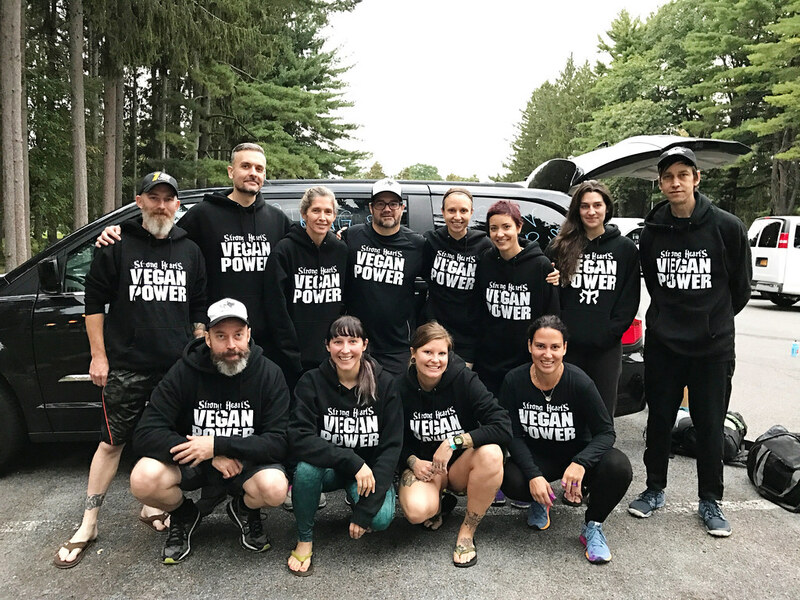 Completing my 9+1 for next year’s NYC Marathon was starting to look iffy, and then there was this Ragnar thing that I’d been dying to run with this group of vegans, which was in September and I wouldn’t be able to even start running until mid-August…. About this time last summer I found myself staring down a calendar filled with events—a bridal shower, wedding, bachelorette party, etc—that would require a certain level of dress, while simultaneously staring into a closet that was sorely lacking in appropriate garments. Clearly it was time to go shopping. 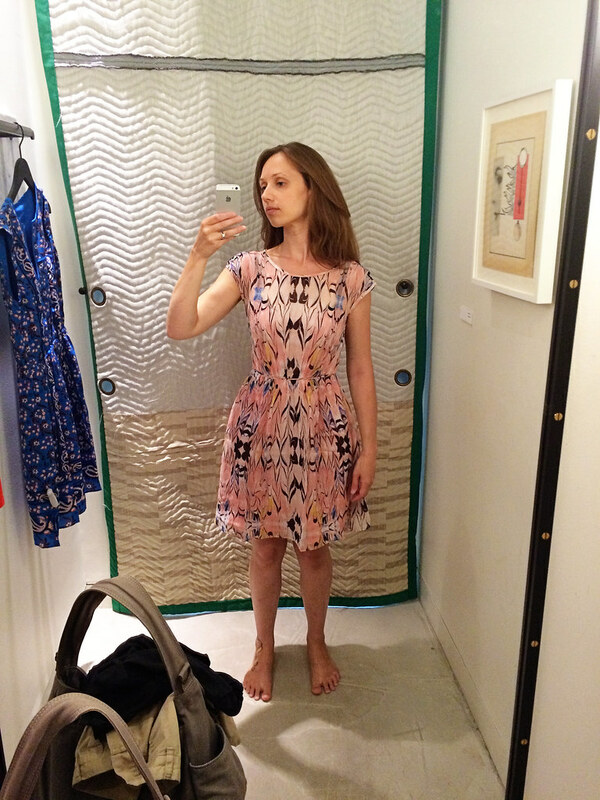 I’m not personally one for shopping (unless it’s for groceries!). I go when I need something specific and make every attempt to get in and out as quickly as possible. This made it especially disappointing when, after hitting several stores, I couldn’t find anything worth bringing home. 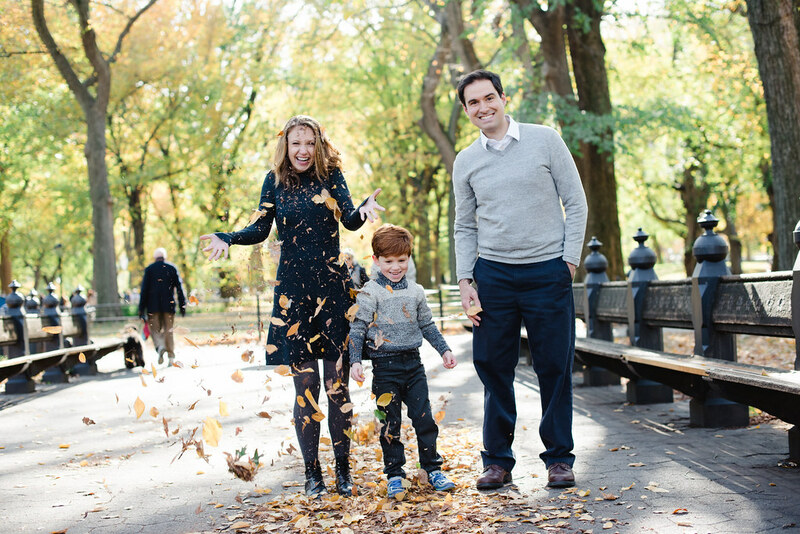 I waited a few days and made a last ditch trip one morning while Roman was at preschool. Happily and rather easily, I found a couple items that I actually liked! As it was nearing time to go get the kiddo, I made one final pass through the store, just in case. 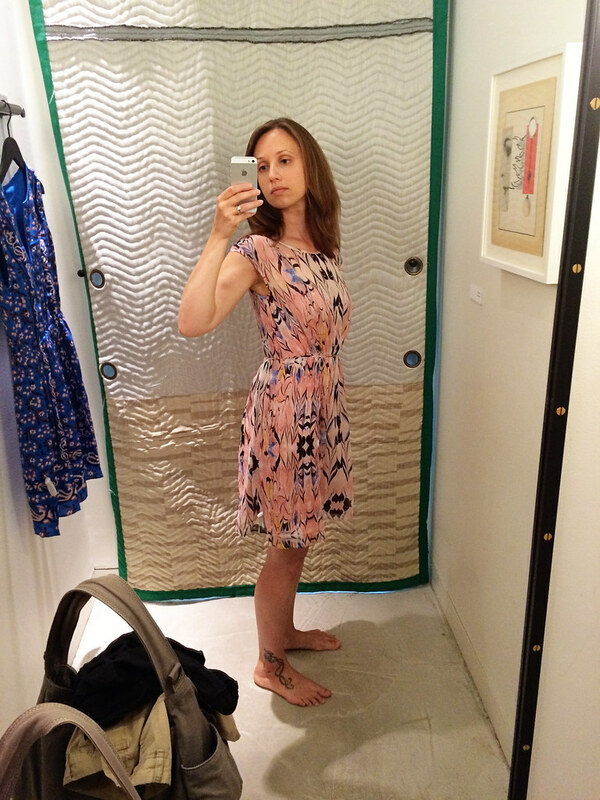 There was this crepey, patterned pink dress that I initially dismissed as being “too crazy”, but I was feeling optimistic after having found a couple nice pieces and decided to try it on. It looked surprisingly good. I texted a picture to the hubby to confirm. “I like it!” he said. I tossed it over my arm along with the other items I’d selected, checked out, and rushed off to pick up Roman. It wasn’t until I had the dress home and hanging in my closet, wondering what its cleaning instructions were, that I even thought to check the tag. This is something I’m generally pretty good about doing. I find a piece that I like, and, particularly if the material isn’t immediately identifiable to me, I check the tag before I even try it on. Cotton or synthetics? Go. Wool or silk? No. After my recent string of misses, however, I’d been so desperate to get out with something, not to mention bumping up against preschool pick up time, that I completely forgot to check the pink dress. There are jokes and memes about vegans and hummus for a reason. We like it, we eat a lot of it, and if you ever attend a vegan potluck, you should expect to see approximately one container of hummus for every three people in attendance. It happens: occasionally we live up to the stereotypes. 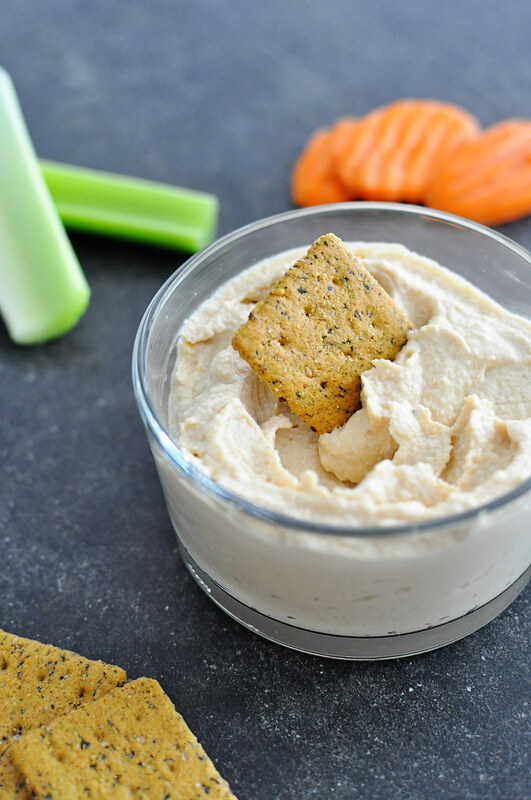 Of course you don’t have to be vegan (yet 😉 ) to enjoy hummus. 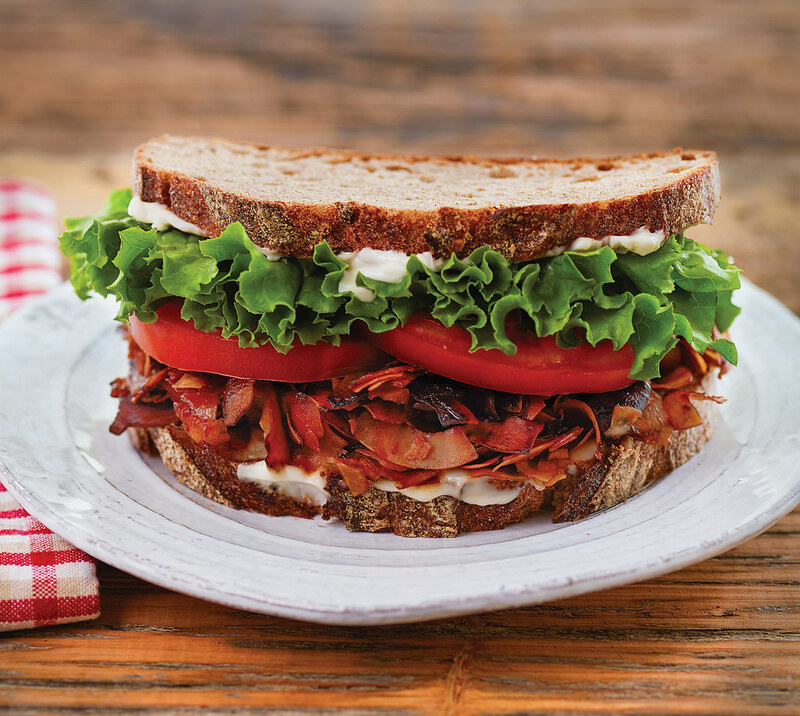 Years ago, I, like so many hipsters people today, possessed a deep love of bacon. It never reached the level to where I found myself applying bacon-flavored lip balm while wearing a bacon bikini (for your own sake please don’t google this), but I do recall once drafting a blog post professing my love for it. I can happily—and with great retrospective relief—say that I never pressed publish on that one, but the point is that I get it. I get the obsession, and I get why it’s one of the most common hangups of the non-vegan. I don’t miss it. At all. Not even a little bit. Being able to fully open my heart and enjoy how awesome pigs are is so much better than compartmentalizing my dietary choices so I can feel okay about eating a few cholesterol-laden, artery-clogging strips of Group 1 carcinogen. It’s not the pig part of the bacon that makes it so delicious. You know what makes bacon so tasty? It’s the smokiness, the saltiness, the subtle sweetness, and the crispiness of it. It’s the sensory-igniting combination of all of these wonderful things at the very same time. That’s why so many people love bacon, and why I love it too. Love? What’s this present-tense love of which I speak? Like so many other things (Okay basically everything. You know there’s a plant-based burger that bleeds now, right? 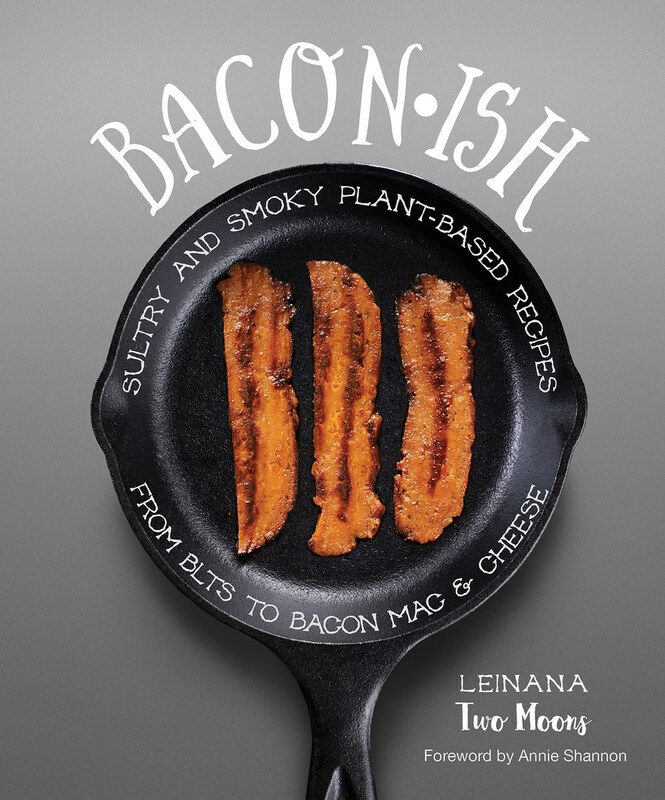 ), there is a vegan and cruelty-free way to satisfy your bacon cravings. Make that more than 10 ways to satisfy your cravings.